I have always loved Easter. I like to blame the fact I was born close to Easter for my love of all things sweet! I always look forward to seeing the Easter goodies lined up on the shelves in the supermarket and finding the best gifts for my loved ones. Here is a selection of some of the best Easter treats this year! Not a brand I would usually associate with Easter, but I love Elizabeth Shaw chocolates and was thrilled to find they actually make Easter Eggs. They cater for both lovers of dark and milk chocolate. The Zesty Crisp Selection consists of a milk chocolate Easter egg with a mixture of lemon flavour dark chocolates and orange flavour milk chocolates. The Mint Crisp selection consists of a dark chocolate Easter egg with a selection of 24 mint flavour rich dark and smooth milk chocolates. The actual egg is made of fantastic quality chocolate (which is always important!) and is incredibly moreish! I love the Zesty Crisp Selection and will be looking out for it in my local supermarket. They also sell a Whisky Collection egg which I haven't tried but definitely sounds interesting! The RRP for the Elizabeth Shaw Large eggs is £10 and they can be found in Tesco, Asda, Waitrose and Ocado. Lindt chocolate is like an Easter tradition. It wouldn't be Easter without a Gold Bunny. 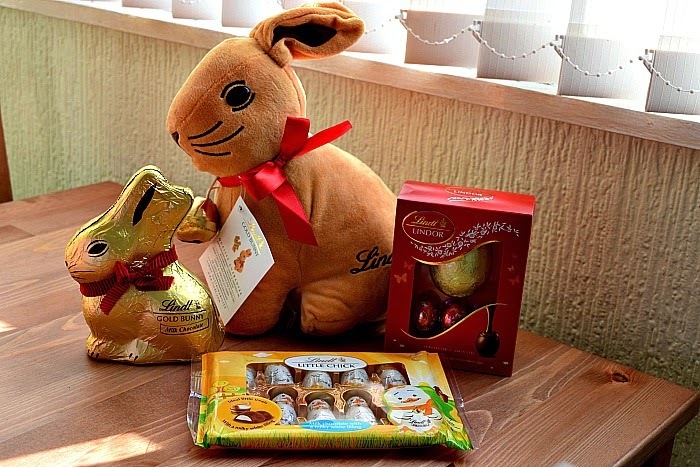 Lindt now have a huge range of Easter products and sent us a few to give our opinions on. Gracie was most pleased to spot the cuddly Gold Bunny. Andy is probably one of Lindt's number one fans and so she recognised the bunny from 'Daddy's chocolate' straight away. The Gold Bunny soft toy is an exact replica of the famous chocolate bunny and a little zip underneath opens up to reveal three mini bunnies inside. The Gold Bunny soft toy has a RRP of £15. The Classic Gold Bunny is also available again this year in a few different sizes and flavours and retail at around £3. Lindt also have a range of chocolate eggs in different flavours and sizes we were sent the mini milk chocolate egg with Lindor filled eggs. The mini Easter egg is perfect for those with smaller appetites, as much as I love it I find Lindt chocolate is so rich that I can't eat too much in one go so it is a great size for me. I also thought it would be a great prize at the end of an Easter egg hunt! The Lindt Little Chicks are ones I haven't seen before. The milk chocolate chicks with a milky white centre are a lovely treat. Great for adults and kids and ideal for hiding around the garden for an easter trail. 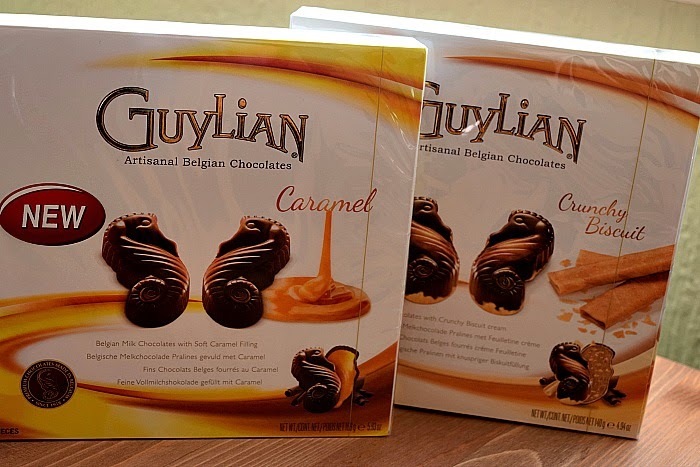 Another classic chocolate brand, Guylian do have an Easter range but I have to talk about two of my favourite Guylian products to date. The Crunchy biscuit seahorses are actually amazing. I have actually treated myself to them a few times now, I just can't resist! The caramel ones are lovely too, they are actually Andy's favourite out of the two. The smooth Belgian chocolate is the perfect accompaniment to the fillings. I have to say I would be more than happy to receive a box of Guylian Seahorses for Easter, in fact I would be happy to receive them for any occasion! They do also sell a range of Easter eggs with the classic chocolates if you were looking for something more traditional. Everyone loves Swizzels sweets and their Spring Selection tub is a great gift for friends and family this Easter. Containing some of Swizzels most popular sweet lines, Fruity Pops, Refreshers, Parma Violets, Lovehearts, Fizzers, Double Lollies and Drumsticks, there really is something for everyone! Definitely an idea to think about if buying for anyone with dairy allergies this Easter! We have found them great here for Zach. It is always nice to have nice treats to share with him and he loves Love Hearts, Swizzels and Parma Violets. 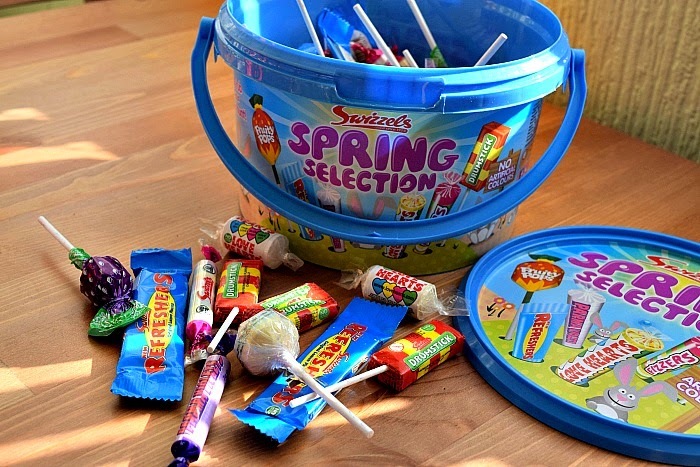 The spring selection is available in a large tub RRP £5 or a share bag RRP £1. Swizzels are currently running a fun #sweetmemories campaign. A competition with a weekly draw to win some fabulous Swizzels goodies. Just share your sweet memories for a chance to win. You can find out more here www.swizzels-matlow.com/sweetmemories. My kids love crafts! 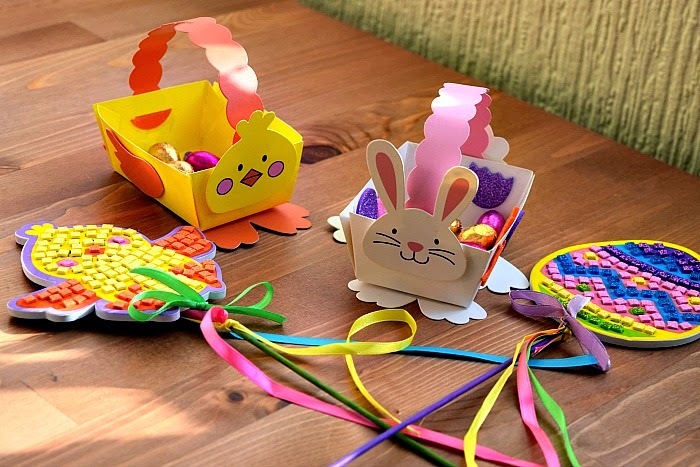 We recently tried out some Baker Ross Mother's Day crafts and were also sent some lovely Easter crafts to try out. We made some great baskets ready for our Easter hunt. The kids had so much fun making the baskets and stuck some Easter themed stickers inside and around the outside of the baskets. We also tried out some fab mosaic Easter wands which were lots of fun. A bit complicated for Zach so I helped him with his but Gracie did hers alone and really enjoyed herself. I am always happy for the kids to receive craft items as gifts for any occasion and Baker Ross have a fantastic range of craft activities for all occasions and at great prices! We were sent samples of the above products for the purpose of writing this post but all opinions are my own. 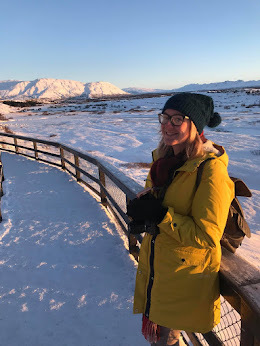 I have looked at the Elizabeth Shaw ones and have to say I want to give them ago as had some of the mint items they do was so nice. Some wonderful Easter goodies there, but we are still finishing our Christmas chocolate. Oh love Lindt stuff. There choclate actually tastes nice! We will be getting some swizzels sweets for my son. He doesn't like chocolate and is always a little sad to be given chocolate as prizes at school or as gifts during the Easter period. I shall be scoffing the chocolate myself!! I love the Lindt bunny range - but the Elizabeth Shaw eggs look good too. 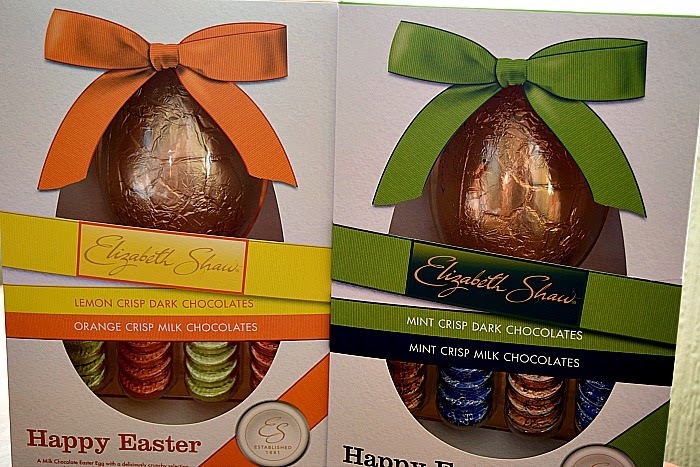 The elizabeth shaw mint one would be my fav - the kids love quantity over quality so that they can have endless egg hunts! Any chocolate is gratefully received here, love the craft idea too...must try and find some time to do something when my youngest breaks up from school.